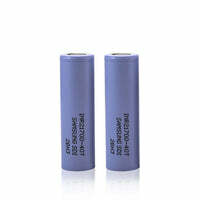 Are the batteries that you are currently using getting a little old? Maybe you just need more power. Well, whatever the reason is, you cannot go wrong with picking this set of batteries up. The 40T Flat Top Battery is the one that is brought to us by Samsung. The batteries are going to come in packs of two, which is the amount most mods require if not just one. These are batteries are going to have the typical size you usually work with. However, these batteries are 21700 batteries, which some mods are not compatible with so be careful. you do not want to purchase these and then realize you actually needed 18650. These batteries are going to have a capacity of 4000mAh and a maximum continuous discharge rate of 25A. They are also going to have a voltage of 3.6V and a complete charge voltage of 4.2. Batteries do last a very long time, especially if you are charging them correctly, but that does not mean they will not get old and weak. Sometimes you have to know when it is time to ditch the old ones and pick of these bad boys that will bring you more good times. 40T Flat Top Battery (2 Pack) - Samsung has a rating of 5.0 stars based on 1 reviews.